This oil can make your beauty wishes come true! Sunflower oil is loaded with vitamin E that helps prevent fine lines and wrinkles. Use it as an evening face serum by putting a few drops of sunflower oil on your palm and massaging it on your face in circular motions. 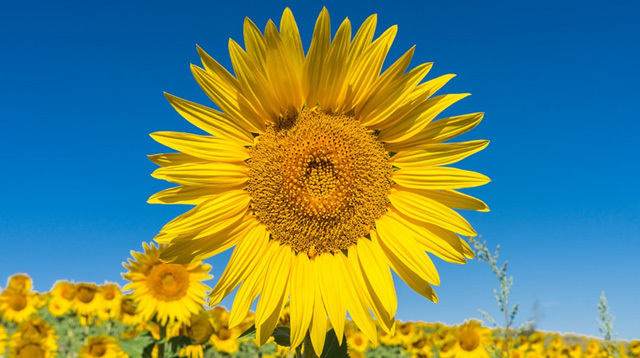 Rich in vitamin A, C, and D, sunflower oil is a great solution for zapping zits. Plus, the vitamin E content accelerates the skin tissues' healing process faster, so there's less scarring when you dab a tiny drop of sunflower oil on a zit before bedtime. You need not worry about it clogging your pores because it is easily absorbed by your skin. The fine quality of the oil makes it suitable for the thin under-eye area. Use it as a potent, antioxidant-rich sub for eye cream. Be a kitchen beauty wizard by whipping up this anti-aging concoction: Mix a half cup of yogurt, one tablespoon of sunflower oil, and juice from three calamansi fruits. Yogurt helps lift dead skin cells, calamansi brightens the complexion, and sunflower retains the moisture and resiliency of your skin. Leave on the face for 15 minutes for a revived complexion. Get rid of bumps and darkness when you apply sunflower oil on your underarms before you sleep or right after shaving, waxing, or tweezing. Tame frizz and flyaways by stroking your tresses with a few drops of sunflower oil. Fuse sunflower oil with your regular conditioner, and use it as a deep conditioning mask for parched hair. Leave it on your tresses for five minutes and rinse. Alternatively, you can use sunflower oil alone and massage from root to tip. Wear a shower cap, leave it on overnight, and rinse with cold water the next day to reveal shiny and silky smooth locks.